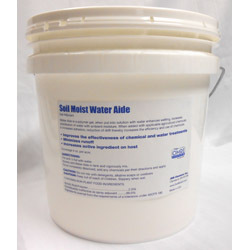 Water Aide is an OMRI-approved adjuvant/wetting agent that improves the efficiency of water or any chemical application. It reduces water runoff and increases water penetration. For use in landscape and hydroseeding applications, it helps reduce turf/plant watering and reduces any drift. It improves the active ingredients in any application.